Join this 8 day luxury cruise aboard the MS Paul Gauguin, designed especially to navigate the shallow seas of Tahiti and French Polynesia. The ship is able to visit the smaller ports that larger ships can’t reach and blends in effortlessly to the stunning setting of the South Seas. As a passenger on board you'll enjoy an extension of the informal, relaxing environment of the islands, coupled with five-star service, comfort and luxury. Amongst the luxurious aspects you can expect from this cruise are spacious suites and staterooms (more than 70% with their own private balconies), an on-board water sports marina, a choice of three open-seating dining venues and an extensive spa. Begin your voyage in Tahiti, the capital of French Polynesia. You will embark the MS Paul Gauguin and check into your cabin; with a poolside deck to relax and an on-board casino there’ll be plenty to keep you busy until lunch. Known as the ‘Garden Island’ Huahine is home to lush rainforest and some of the best preserved archaeological remains in French Polynesia. Spend your day relaxing on the beach, explore the island’s sacred sites or snorkel in the lagoon, this island paradise will truly relax you. The island of Motu Mahana is located adjacent to Taha’a and is reserved exclusively for Paul Gauguin guests. With white sand beaches and swaying palms, this secluded, idyllic island is the perfect place to enjoy a spot of volleyball, learn Tahitian cooking, swim or just relax and enjoy your surroundings. Enjoy a barbeque lunch and watch some Polynesian entertainment. Today we set sail to the famous island of Bora Bora. Popular with honeymooners, this stunning island is dominated by Mount Otemanu and surrounded by a crystal clear lagoon. You'll stay here for two nights to give you plenty of opportunity to explore this island paradise. Optional tours today include underwater walks, snorkelling tours or a sunset jet boat ride. On your second day, you can choose to take part in a 4 wheel drive safari or a glass bottom boat ride followed by a relaxing evening on board the ship, enjoying the views. The island of Moorea has certainly been blessed with its share of beauty, with fresh fruits and flowers, spectacular mountain peaks, peaceful lagoons and pristine beaches you will be pleasantly surprised by your final island visit. You'll spend two nights on Moorea, where you can go on a dolphin watching expedition with a marine biologist and see these fascinating creatures in their natural habitat. Today you can visit the local craft and produce markets. Be sure to try the pineapples – said to be the most delicious pineapples in the whole of French Polynesia! 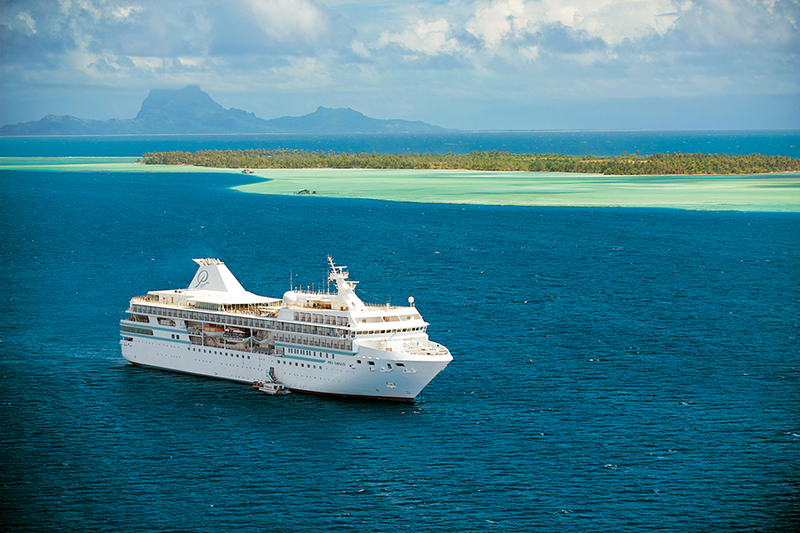 Later this afternoon the MS Paul Gauguin will depart for Papeete where you will spend your final night on board. Your cruise has come to an end so once you return to shore, take a transfer to the airport for your onward journey. Alternatively you could enjoy a couple more days on dry land in Tahiti, ask us for suggestions. The dry season in French Polynesia runs from May to October and this is the best time to visit, the weather is cooler and there is less rainfall. Temperatures rise during the rainy season, which runs from November to April, when weather will generally but humid, cloudy and very wet. Peak season is in line with school holidays and is during the months of July and August – it can be tricky getting flights and accommodation at this time. If you're looking for a longer cruise, why not try our 11 day Paul Gauguin Cruise through the Society Islands and Tuamotos?